Rise, resist and repeat: the power of Union women! 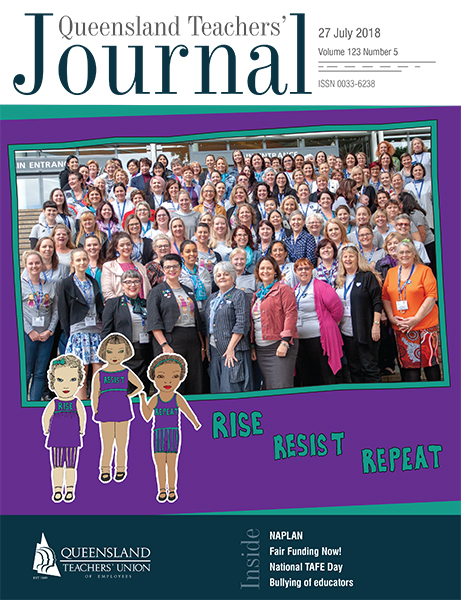 Held on the first Monday of the winter vacation, the QTU’s Biennial Women’s Conference is always an exceptional celebration of feminist unionists. This year, the conference theme was “Rise, resist and repeat”, a nod to the three Rs but also in recognition of the often-exhausting cycle we find ourselves in when campaigning for gender equity. QTU women travelled from across the state to join with QTU Officers and Life Members at the Brisbane Convention and Exhibition Centre. A pre-Conference catch-up took place the evening prior, with special guest Di Farmer MP, Minister for Child Safety, Youth and Women and Minister for the Prevention of Domestic and Family Violence. The first keynote of the conference was “Change the Rules for Working Women”, from the ACTU’s National Campaign Coordinator, Kara Keys. Kara was followed by AEU Federal Women’s Officer Olivia Brown’s “Patriarchy and Privilege” keynote. The first panel, “Rise”, focused on gender equity for students in schools. We heard from Inari Saltau, the National Director, Outreach and Engagement of One Woman Project, on inspiring girls to become social activists in schools. Jan Maresca, Executive Principal of Stretton State College, shared a wonderful and inspirational story of students’ engagement in their uniform choices and the film they made to tell their journey. Letitia York, Senior Education Advisor, Our Watch, explained the pilot “Respectful Relationships” program being undertaken across 10 Queensland schools and what it will mean for the prevention of domestic and family violence. Our second panel, “Resist”, focused on the QTU and our action for QTU women. Kate Ruttiman, QTU Deputy General Secretary (Member Services) focused on EB8 and inspired us to look towards EB9. Acting QTU President Sam Pidgeon reflected on 10 years of NAPLAN in Queensland schools and the Union’s action in seeking a review. Paige Bousen, QTU Assistant Secretary – Education Leaders, explained the PPCR process, and what it will mean for women in promotional positions. Following lunch, we got hot and sweaty and laughed a little too much with the antics of Anna Go-Go and her protest dancing insights and moves. Lynn Hardt, Q Super, gave us all real and practical tips on how to make our super work that little much harder for us. Our third panel for the day, “Repeat”, featured a truly remarkable collection of women who focused on intersectionality, and the wider community. Ali France, a disability advocate and the ALP candidate for the federal seat of Dickson, shared her confronting story of losing her leg and then struggling to find a place as a capable and skilled TV producer. The statistics of employment and the wage gap for women with a disability are truly frightening. Tegan Acton, DoE Project Officer (LGBTIQ+ Inclusion), shared different strategies on how to be a better ally in the workplace, and the strategies the department are undertaking to be a better employer to LGBTIQ+ employees. The final panellist for the day was Rochelle Courtenay, founder and Managing Director of Share the Dignity. It’s a shameful fact that in Australia, girls are missing school because of the inability to source feminine hygiene products. We are all in a privileged position to be able to assist and help them and support the Share the Dignity drives and programs. The day closed with the unveiling of the QTU honour board, recognising and celebrating the QTU women who have received the Emma Miller Award. It was a fitting and moving way to bring the conference to a close. The closing remarks and thanks were delivered by Acting QTU Vice-President Jenny Swadling. The conference was filled with laughter, stories, tears and sisterhood. Thank you to all who gave their time and energy into making it such a memorable event.